So you've got a little spare time on your hands, Spotify is playing through your list of favourite songs, and you're wondering to yourself "I'm a data scientist, what would be cool to analyse?". 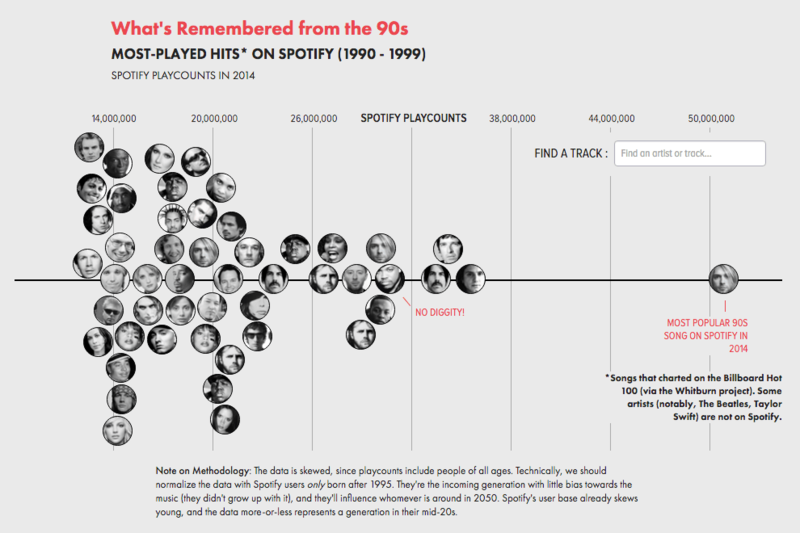 At that very moment, Smells like Teen Spirit by Nirvana starts playing, you crank the volume up to 11 and that's when the penny drops… "What about looking into the timeless classics from the 90s and see their popularity by play count today ?" That's precisely what Matt Daniels did and documented in The Most Timeless Songs of All-time. This is a really interesting and fascinating analysis which is well worth the read. I can proudly say that I've contributed a lot to either of those ten tracks - Whitney and Blackstreet aren't my cup of tea - as they feature, and have done so for a very very long time, on my "Listen Again" playlist which regularly gets played.